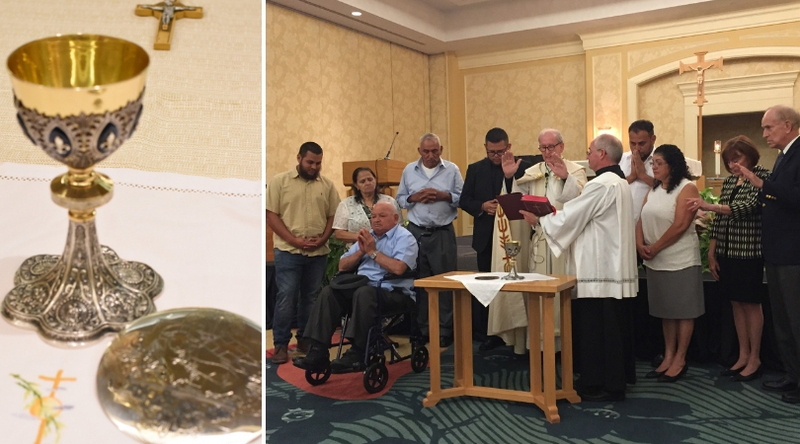 ORLANDO | While on vacation in Medellin, Colombia, Deacon Edwin Cardona knew he would spend some time searching for a chalice. After all, the city has a reputation for having everything a priest might need. He stopped in to Orfebrería Rodriguez on Calle 100 and explained what he was looking for. The chalice is made of sterling silver with blue enamel behind the fleur-de-lis surrounding the upper ring. “The blue enamel reminded me of the Virgin Mary. It’s a French symbol representing Mary,” said Deacon Cardona. The lily flower, or fleur-de-lis, also represents purity. Made up of three petals, it is often representative of the Blessed Trinity as well. In art, the flower also alludes to the Annunciation, appropriate because his chalice and paten are gifts from his parents and Annunciation Parish sacristans, Larry and Chris Strain. Cardona met the couple during his pastoral year at the parish in Altamonte Springs.